You guys! Last night was just what the doctor ordered! We had the best time at our girlfriends Favorite Things party! It was one of those nights where you laughed til your cheeks hurt and everyone had an awesome time. I’m completely amazed that Jordan slept through all of our hootin’ and hollarin’ but thank God she did! Then, just when the party was wrapping up, we walked outside to see it snowing in Houston! It never snows here so of course we were all freaking out as if we’d never seen snow in our lives! 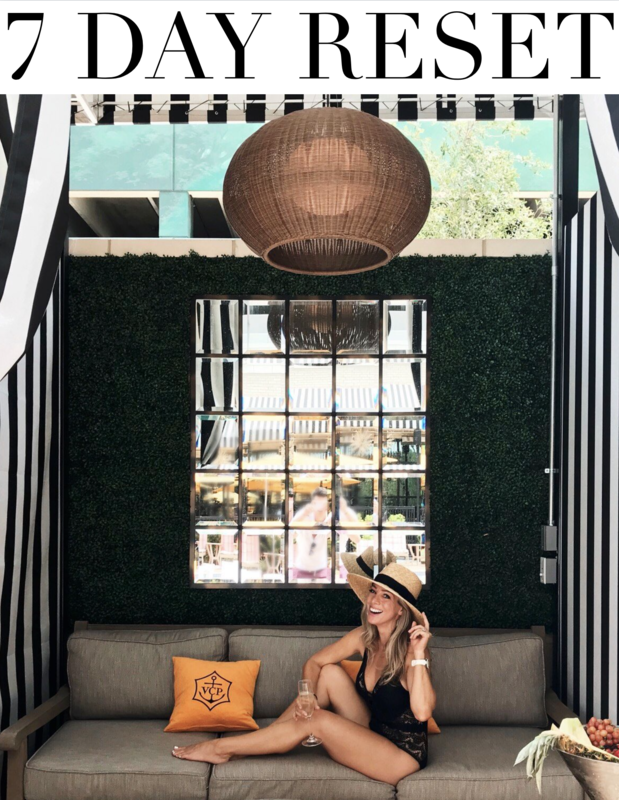 I’m working on a round-up post for you so I can show you what everyone wore (cutest pjs), what we ate (some really yummy things), and of course, what everyone’s favorite things were. 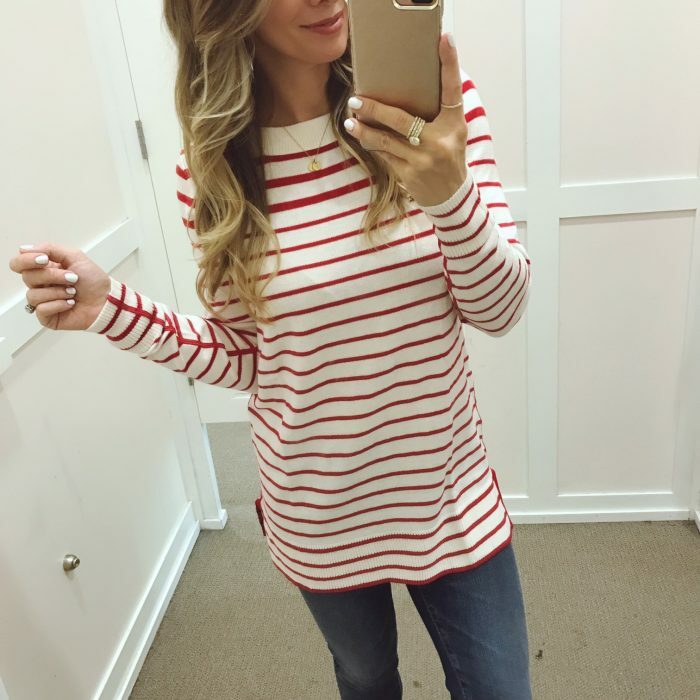 For today’s Dressing Room post, I found some great things for you and a few for me! I swear, being out and shopping for others always has me finding things I like for myself! Good/bad problem, I know! Does that happen to you too? I hope you’re ready to settle in for a nice hot cup of coffee to enjoy with this post- it’s a big one! For size reference, I’m super petite, 5’1, 105ish, 34D. I usually wear 0P or 25 in jeans and XS or 0P tops. 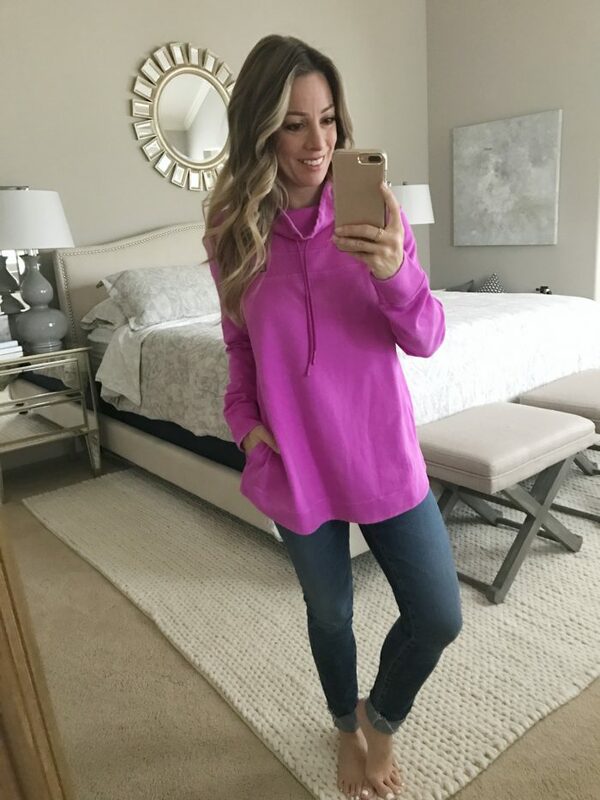 I fell hard for this cozy fleece pullover and ended up wearing it straight outta the store! I’ve been eyeing it for weeks and even included it in the Cozy Girls Gift Guide. It’s the coziest thing and perfect for chilly weather with it’s Polartec thermal fleece material. 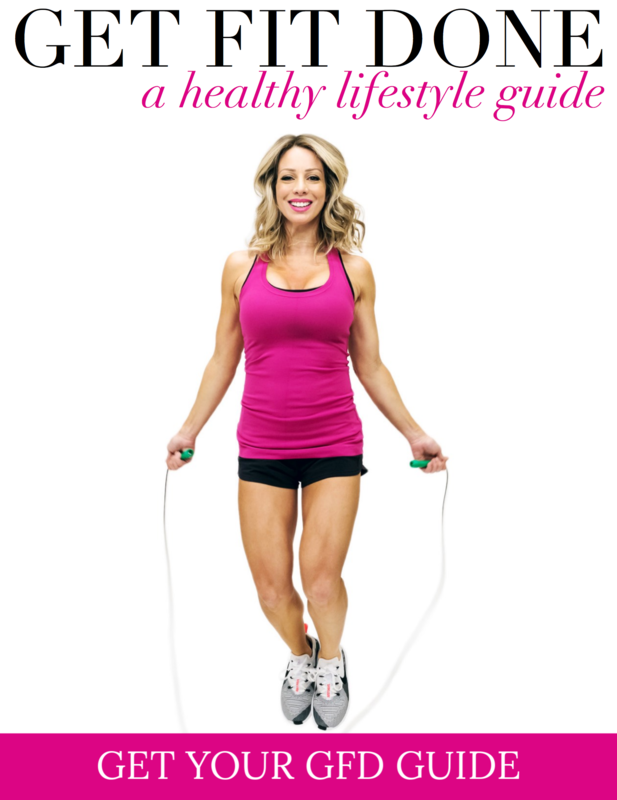 It’s perfect for running around in and has a feminine cut, so it’s not too boxy. I love that it has pockets and I’ve already worn it several times in and out of the house! It comes in lots of pretty colors, and you can also throw it in the washing machine when you need to wash it. 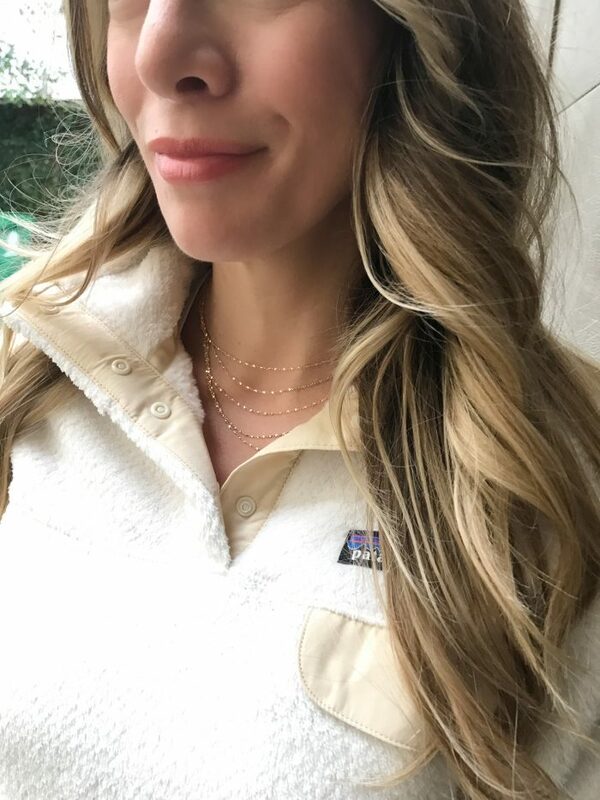 It was so cold and rainy yesterday and I wore the pullover with jeans and Hunter boots and this delicate layered necklace. I mentioned this necklace in the 10 Must Have Jewelry post, but didn’t have a picture to show yet. It’s super delicate and the 5 strands are layered into one necklace. I think it’s so pretty and makes a great under $40 gift. 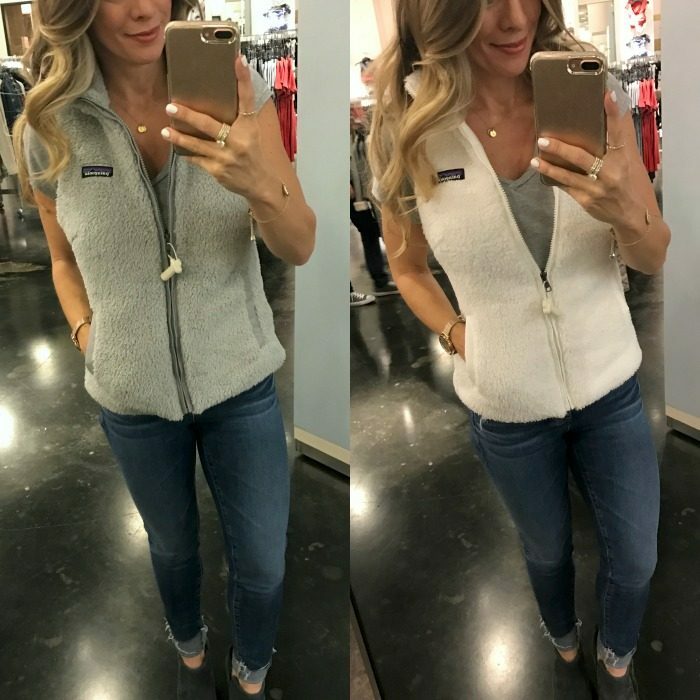 I was really only going to buy one Patagonia thing, until I also tried on the vest . . . Uggggg!! Why do they do this to me??!! The vest is sooo good too! The material is the fuzzy fleece, but the inside is a smooth, silky material. 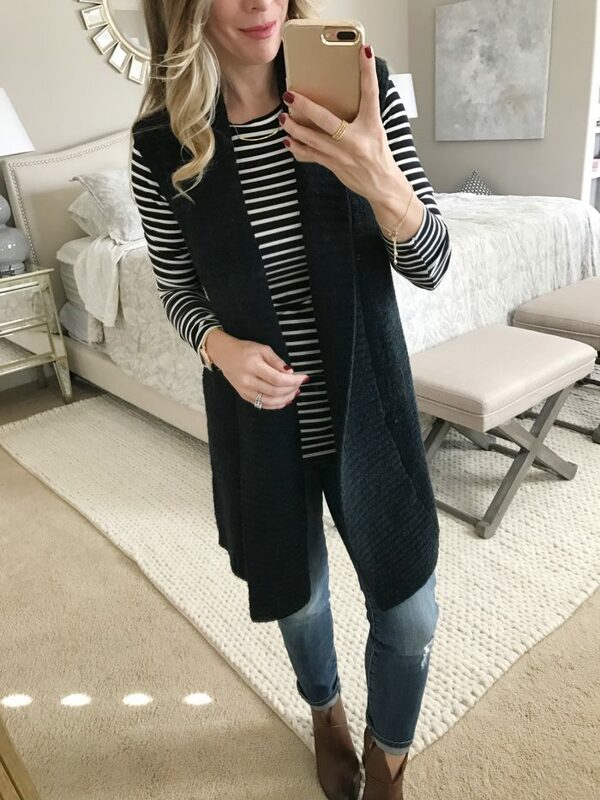 I love a good vest when I have on a cute top but need just a little extra to keep warm. I’d say they run small. The grey is size Small and the white is XS. The XS feels a little snug across my chest when I zip it all the way up, but the length is better than the Small was on me, so I went with the XS in white. Before I bought the Patagonia pullover, I almost bought this jacket by Zella. Zella is one of my favorite workout brands, so I know they make good, quality clothes and this jacket is no exception and it is SO warm but also allows some freedom to move around! They only had size Medium in the store, and my true size is an XS, but you can get an idea of how cozy and cute this one is from this pic. 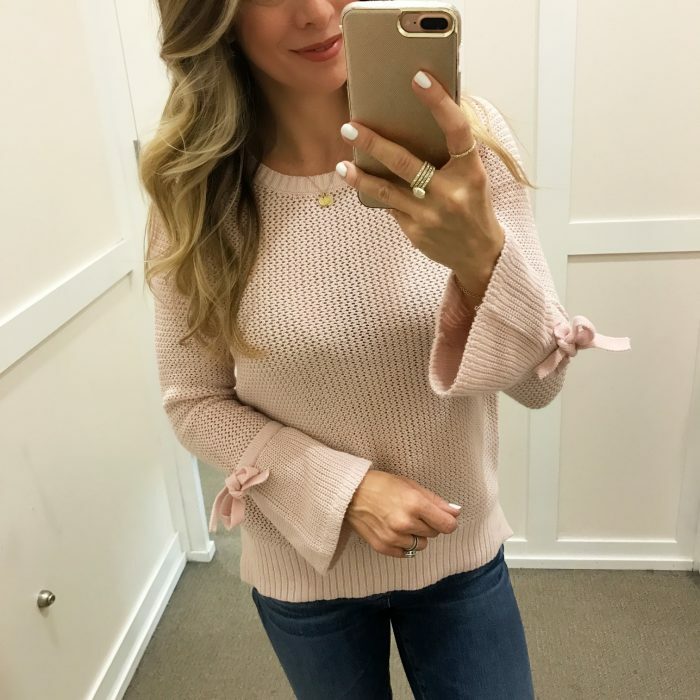 I love the color of this sweater and the bow sleeves are darling! 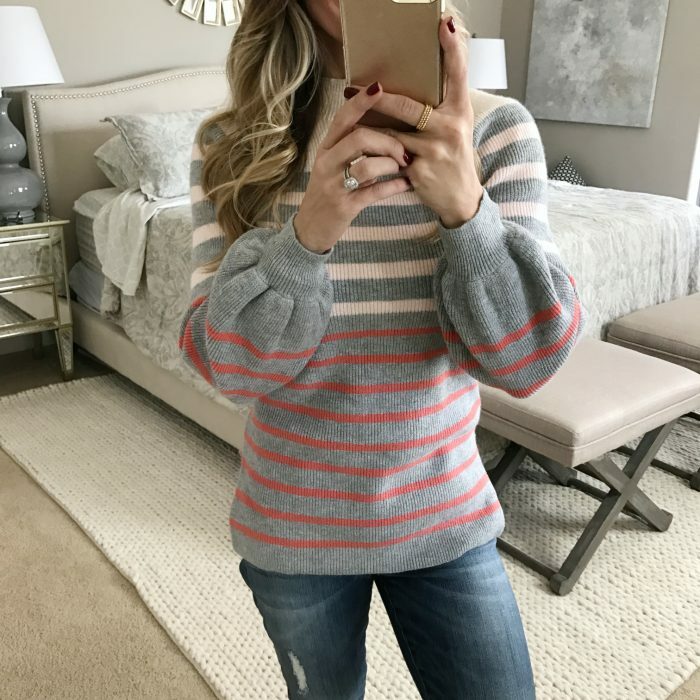 In a world (closet) full of standard sweaters, it’s nice to find one that’s got a cute little detail on it! 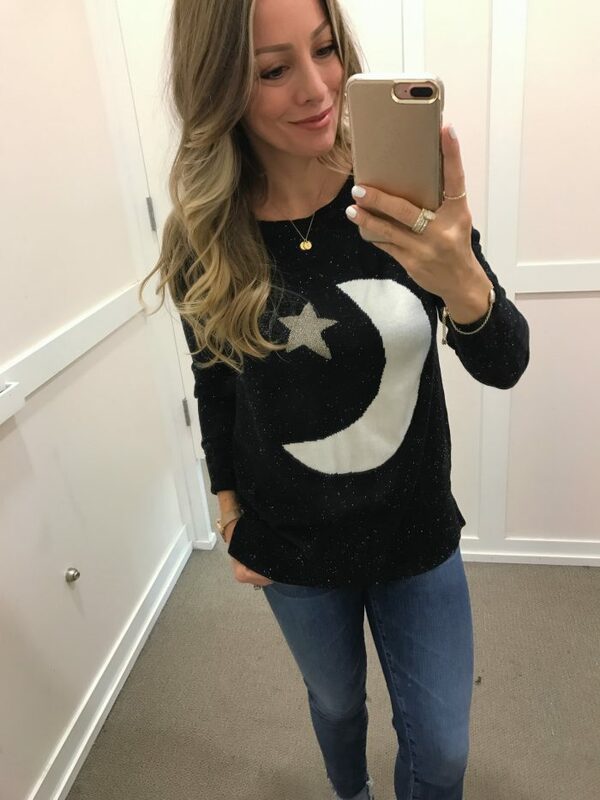 Speaking of cute, how cute is this moon and stars sweater?? It caught my eye as being really fun and different. I would love it with some tall black boots, maybe some fun and funky metallic jewelry too! I’m always a fan of anything with a heart – particularly during the holidays when “pops of red” are a major theme! I would size down to XS, I’m wearing size small because it was all they had out. 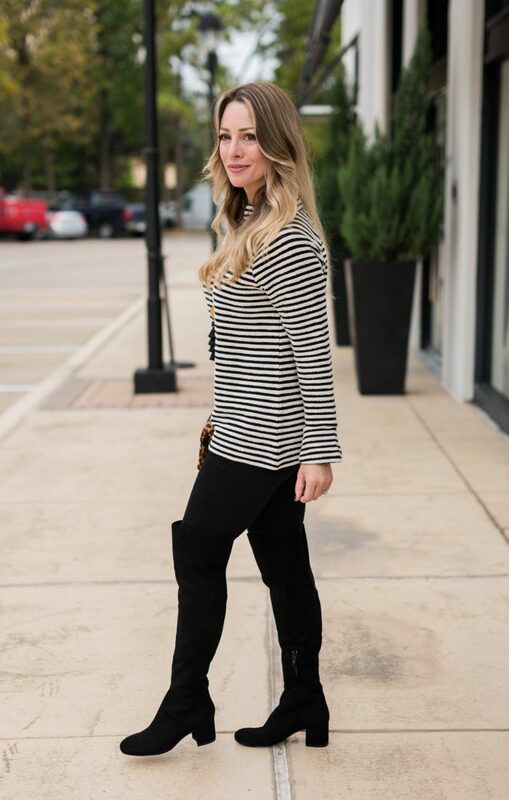 It’s a thin knit sweater which I’m really fond of because it’s perfect for the typically mild weather in Houston. Oh man is this sweater SUPER cute! I mean blush pink with stars?!?! Need I say more?! 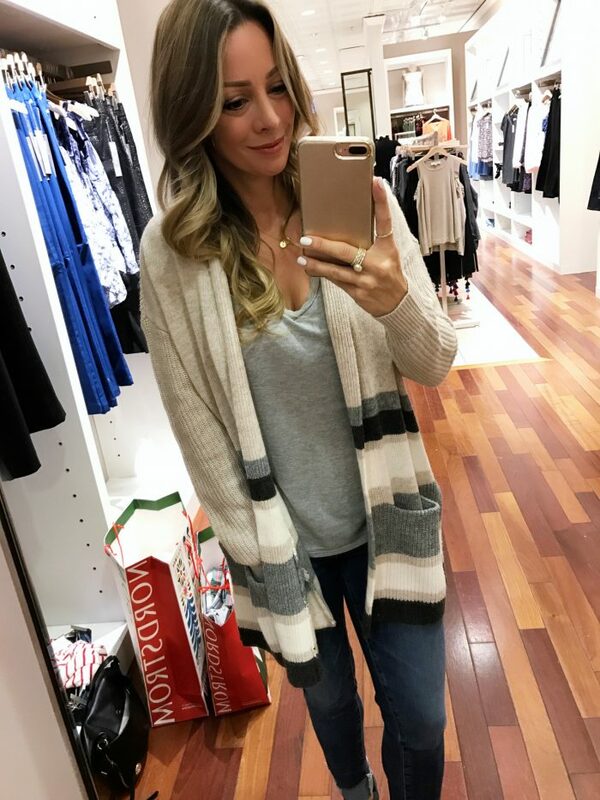 Just when I was about to leave the store, this striped cardigan stopped me in my tracks! 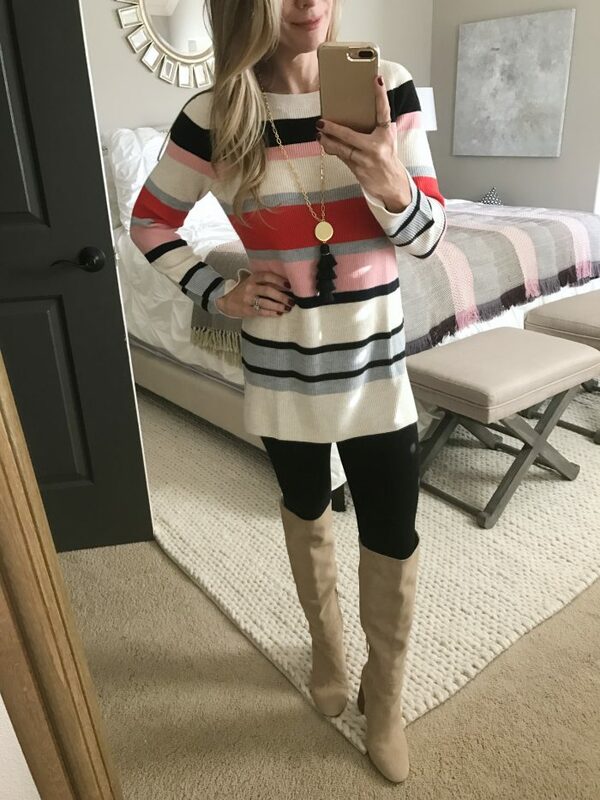 I adore the stripes on it and the combination of all the neutrals! It’s really soft and can be worn over a dressier outfit to make you more warm and comfy! Not to sound dramatic or anything, but OMG, this is literally the softest thing I’ve ever put on my body! 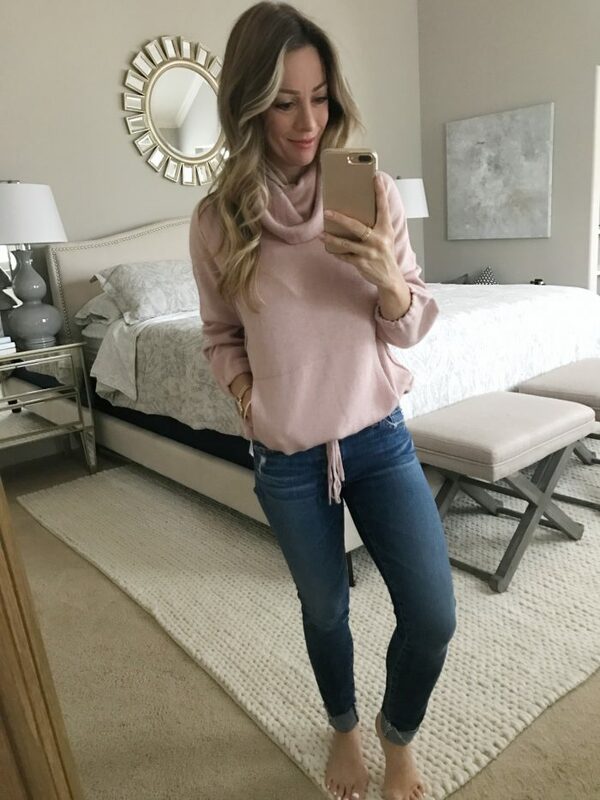 It’s a little springy (like the action, not the season;) with the weight of a regular t-shirt but the ultra-coziness of your favorite winter sweater. Y’all. This might be my new must have top. I love it! This one is the antique mauve stripe, but there are 8 other color options (some stripes, some not). After you buy it, please write to tell me how much you love it too! This pullover is amazing and exactly what you want to run around in on the weekend. 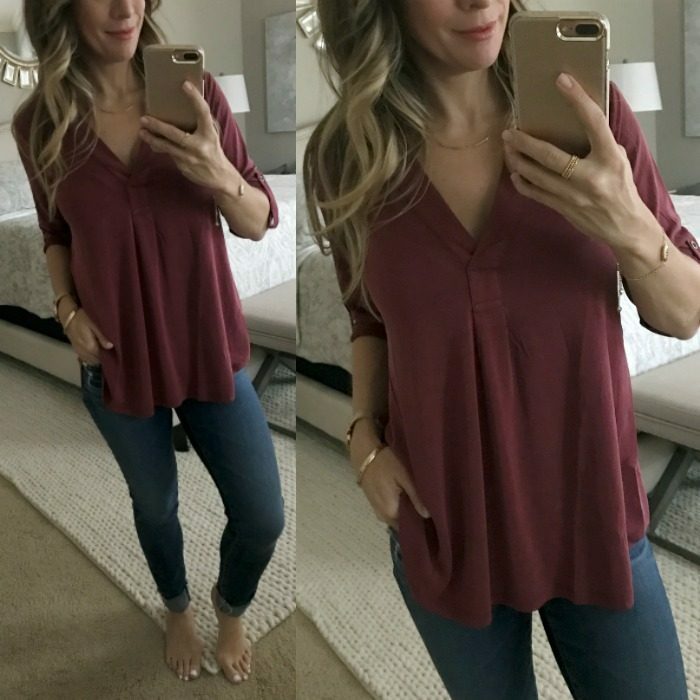 It’s got pockets and a slight shirttail hem – which keeps you from looking boxy in it. I’m wearing an XS and it’s a little roomy, so for perfect fit I would size down but I love it so much – I’m keeping it (they didn’t have XXS or petite). It’s cozy on the inside like a sweatshirt, so it doesn’t need something underneath. The purpley-lilac color is beautiful! The little cowl neck keeps you warmer without being overwhelming. #keeper! 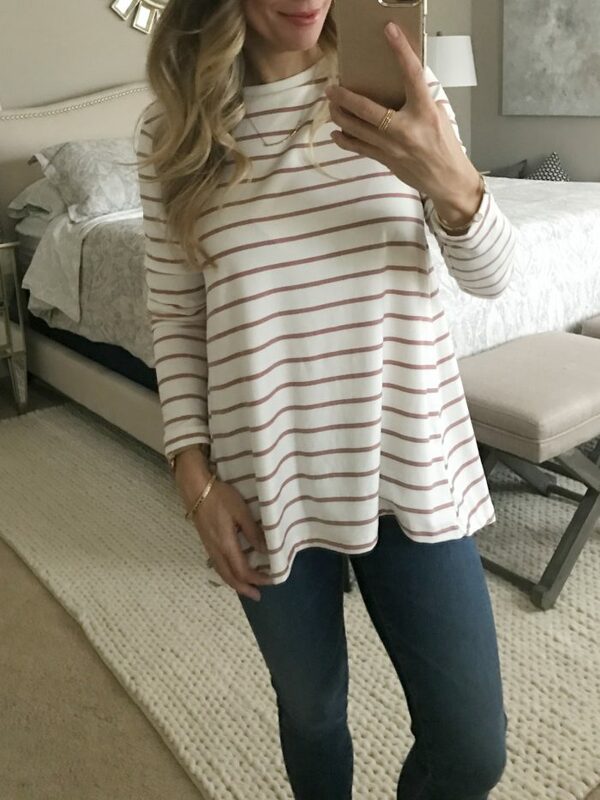 This is one of those versatile sweaters that can be worn on or off the shoulder. Bonus = It’s long enough for leggings!! I like this color white for a nice “Winter White” look. It would be really cute with some leggings and boots for a party when worn off the shoulder. 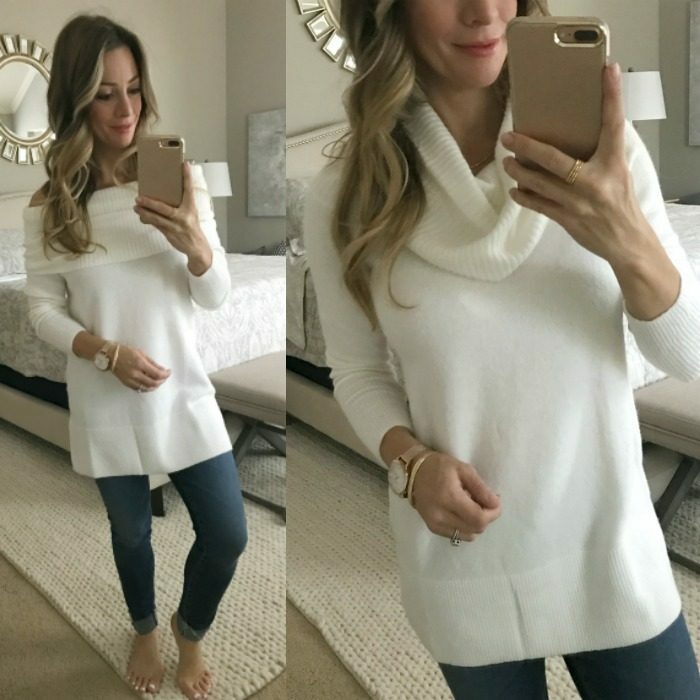 The cowl-neck option is also pretty for a put together look when you’re running around! The description says Wool – but this didn’t feel “wooly” or scratchy at all! 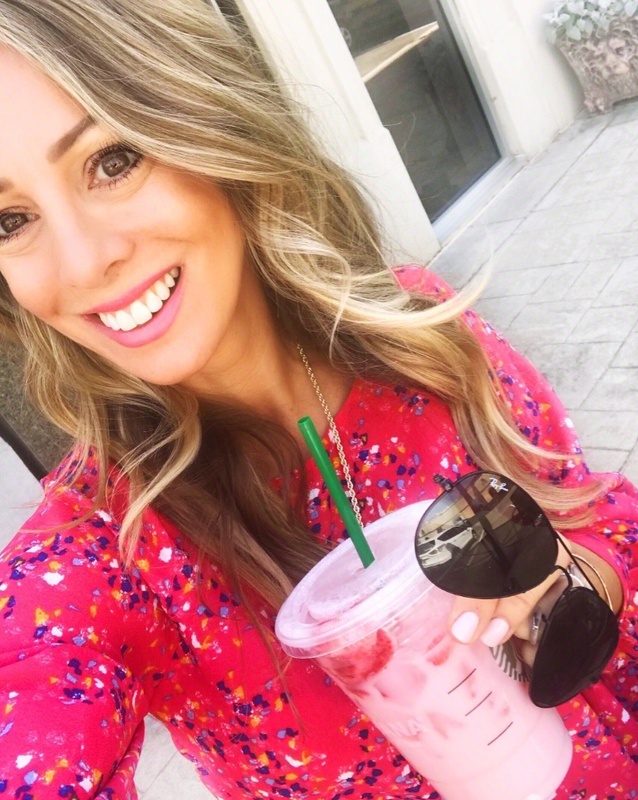 This top reminds me of fruit stripe gum with the little zebra – with the flavor that only lasted like 2 minutes! It’s a fun, happy shirt for fall/winter. The thin knit is easy to wear and it’s good for work or casual. It’s thin enough you could even tuck it into slacks or a skirt. I think this would also be cute in the spring with some white jeans. 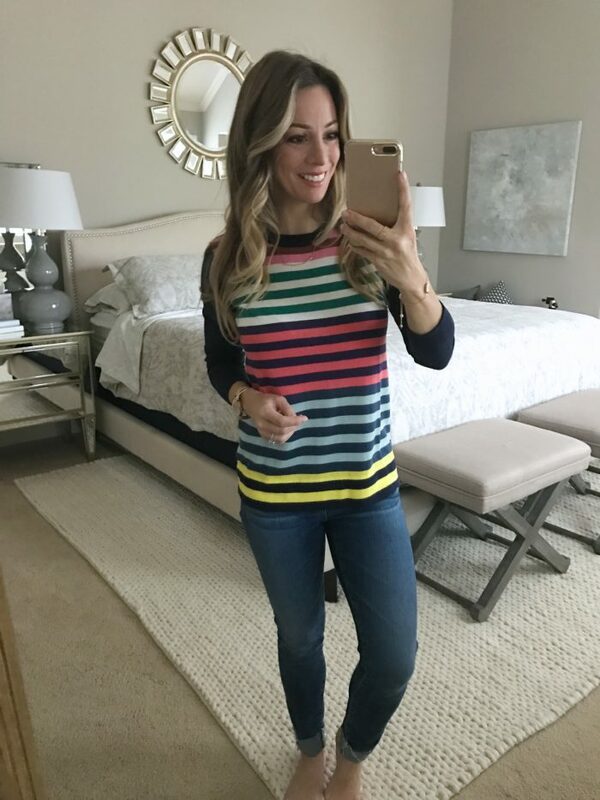 If you’ve been following along, you know I like stripes and I’m really loving the color blocked arms!! I didn’t think I was going to like this sweater when I saw it on the hanger, but I REALLY like it on. Especially like the bubble sleeves! I would definitely wear this on a date night or night out. It’s a good length too and pretty color! 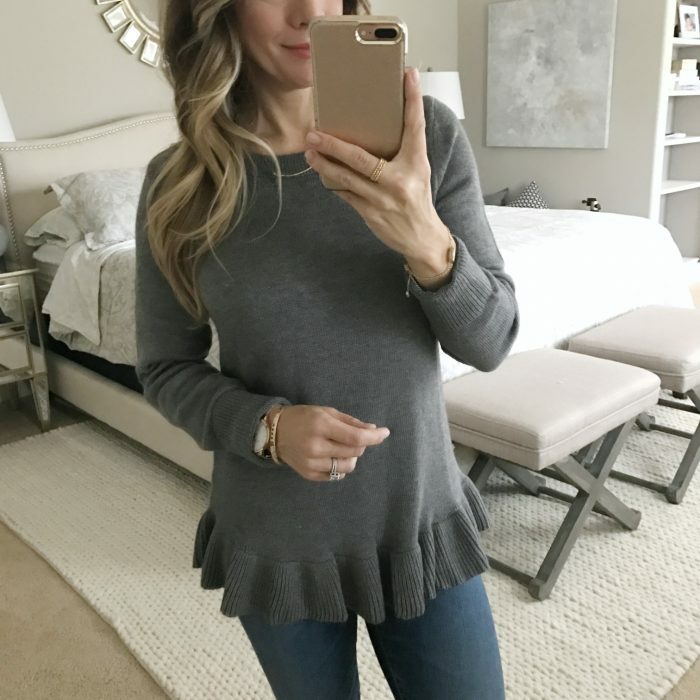 This is a soft, cozy sweater with a flirty ruffle hem. It has the feel of a sweatshirt, but has a really dressy look. The XS was a little loose – so if you’re looking for a more body conscious look, size down. The sleeves were a bit long so I cuffed them, which I think kind of relaxes the look a little. I’m really crazy for how they mixed the plaid pattern with contrasts on the back, on the pocket and on the cough. It’s double the plaid in one shirt!! The XXS is a slim fit on me at the chest – without gaping #praisehands, but the XS would have been too big. It’s slightly longer in the back but can still be tucked in. Plaid is typically casual, but I would love to put this with some nice slacks or skirt too. This shirt just feels super festive and I can’t wait to wear it. I do not think you can go wrong with a plaid button up and jeans. This top is no exception! I like the festive holiday colors of this top – while it’s a lighter and not quite as heavy in red as you typically see in plaid. I’d love to see this with a skirt too or dark wash jeans and heels for evening. I got the XXS in this little tee with bows, but could have gone with an XS to allow a little more room in the chest. 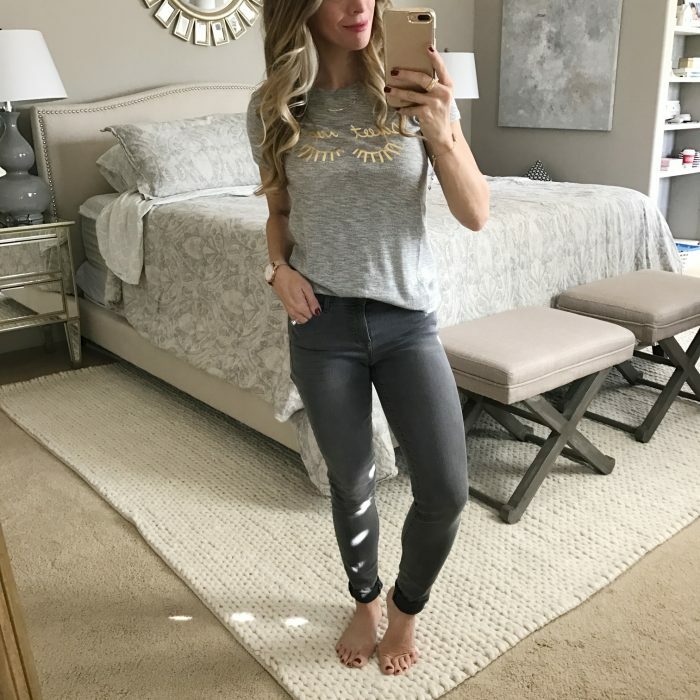 It’s a tee, so of course it looked cute with jeans or black jeans. There’s a part of me that wants to wear this with a black tulle skirt and a statement necklace for a party (see black tee and tulle skirt combo below). This is a really fun look for a holiday party! Not gonna lie, I really liked feeling a bit like a fairy princess in this tulle skirt. A laid-back princess because this embellished tee is super comfy. 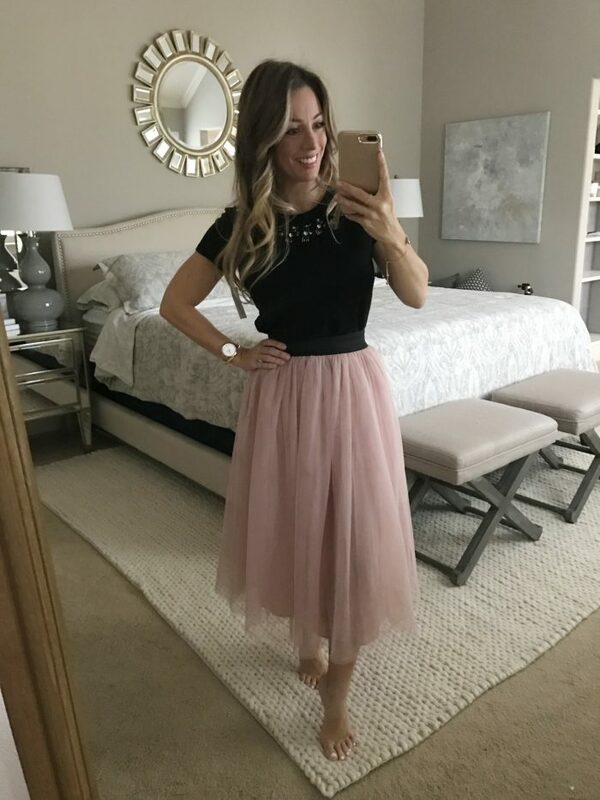 The skirt has a silky lining and two layers of tulle. All that’s missing are some strappy heels and a glass #or2 of champagne! With the holidays in full swing, I’m sure you have some parties to dress up for! 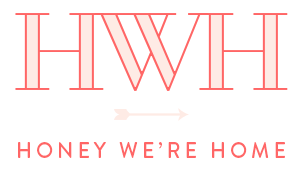 I couldn’t leave you without a few good, well-priced options! It’s a mini dress, but because the neckline is high, you don’t feel too exposed. I’m really digging the lace overlay. I’d call this a really cute, budget-friendly dress. Wow, this is a beautiful embroidered dress! It would be perfect for New Years Eve! The neckline is “plunging” but it’s balanced with the longer sleeves. The detailing on it is really pretty and the silver metallic threading makes it feel just a bit #extra. The hem hits just above the knee and the scallop makes it flirty and a little old-fashioned. The skirt and the front are fully lined, but the back is sheer like the sleeves. #sopretty!! I’m a big fan of Eliza J dresses – especially the Petite fit for us petite gals. This dress is adorable. It could be great for a family function, work party or even Christmas church services! It’s conservative without being all buttoned up – and the lace overlay gives it a really nice feminine detail. The little pom poms on the hem make it seem festive! I’m wearing a 2P, it fits but it’s slightly big at the waist – the 0P would have been too tight at the chest though, so here, I would do a minor alteration at the waist. This dress is so pretty! I really wanted to love it, but the fit was a little bit off for me around the waist and hips. It’s definitely worth a try though because it’s stunning in persona and really makes a statement! The top was snug on me with a bra, but without one, it fit perfectly. The slit in the back is great, makes it easy to walk in the lace. The black one I’m wearing here is only available in limited sizes, but it’s also 30% off! Now that we’re getting a true taste of COLD weather, all we want to do is get all bundled up and cozy when we’re inside! You too?? 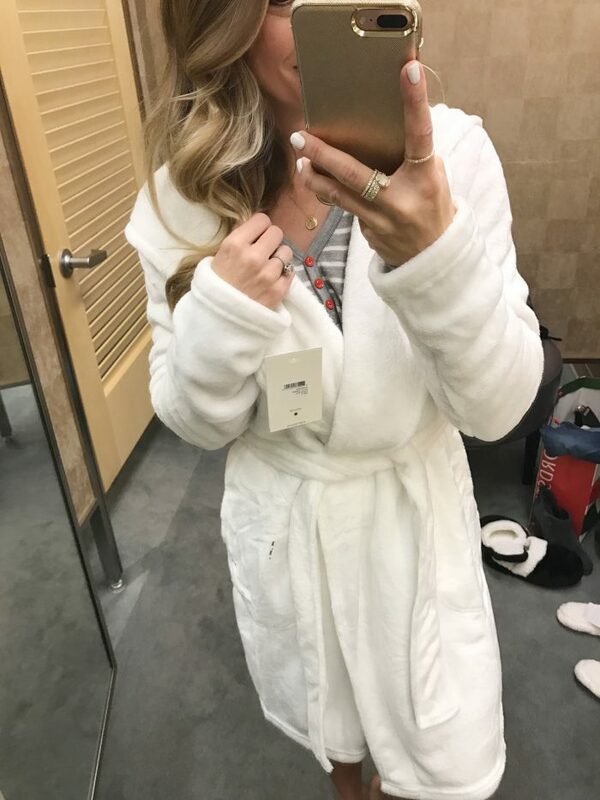 This soft robe is like the one you get a luxury hotel and want to sneak into your luggage . . . but better! It’s soft and ties nicely and also has a hood! It’s warm for when you’re getting dressed out of the shower and cozy for when you’re taking your time getting ready. If white isn’t your thing, it also comes in several other colors. If you like to sleep in a night shirt, these soft and cozy PJs are for you. I’ve been looking for the perfect slippers for around the house. These puff ball slippers are a good price, they’re fluffy and they’re so so so cute!! But… might not be good for stepping outside (which is fine by me! #excusetostayinside). These shorts were a little baggy for me, but an XS would have been too tight for comfort! I did not want to take the sweater off! It was super comfy and a good length to feel comfortable, but I would’ve preferred a small or xs. This shirt is like my Christmas PJ dreams! So cute and the saying makes me giggle. #DearSanta,SorryNotSorry! I love the size and the quality of this bag. It’s a good price, but looks expensive, which always feels like a win. It’s not TOO big that you lose things, but you still can fit a lot of stuff in there. 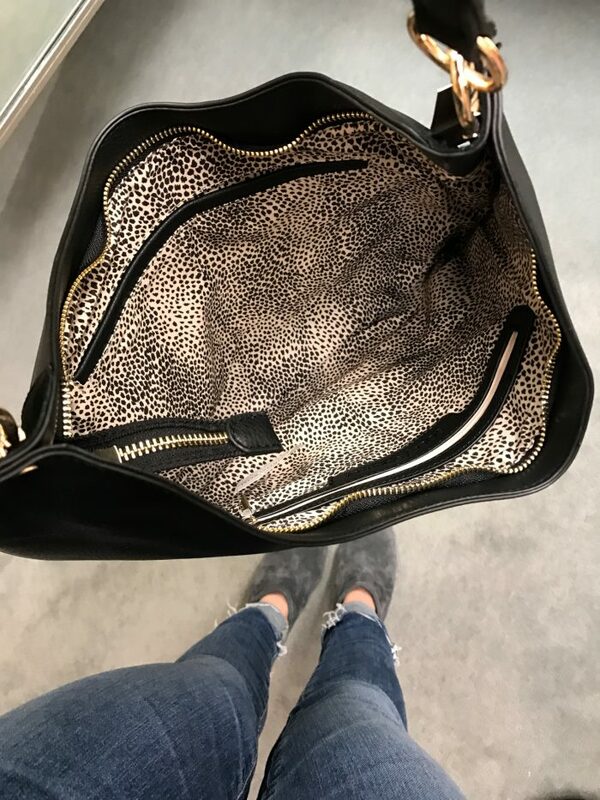 The lining is a light, animal print which I love! It’s faux leather, but there’s a little black suede trim on the side. Before you go, don’t miss out on these amazing sales, especially if you’re getting that Christmas shopping in before the shipping deadlines! LOFT • 40% off of everything!! Don’t miss these faves!! ANN TAYLOR • 40% off everything, 50% Off sales!! EXPRESS • Everything is 40% Off! H&M • 10% Off Everything, Gifts of the Week up to 60% Off! Super Cute Sweaters!! 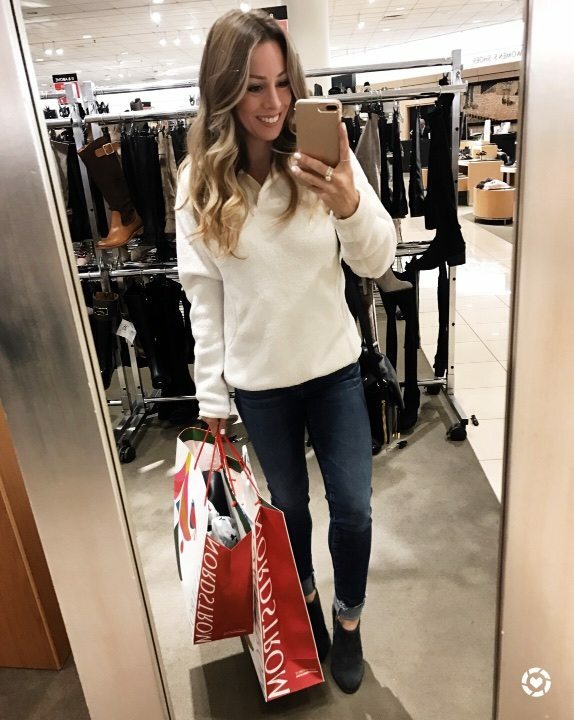 JCREW • 5 Days of Merry “Surprise Sales”!! Friday : 35% Off! This Gingham Shirt!! OLD NAVY • Up to 60% Off the entire store! At least 20% Off of everything!! You look so cute in everything. I especially liked the off the shoulder sweater on you. Thanks so much Kathy! Have a great week! 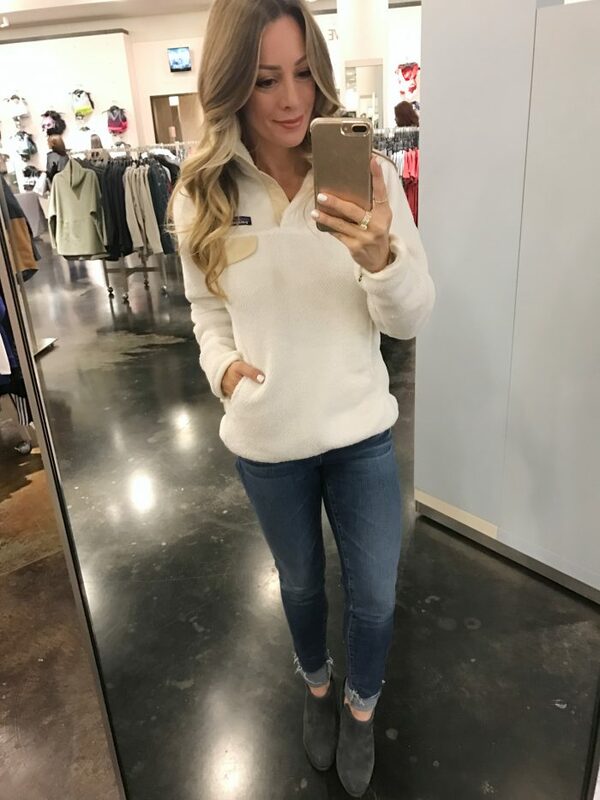 I’ve been thinking about getting a Patagonia vest because they’re just so cute! And I’m loving that blush stars sweater! I’m so happy with the Patagonia purchases! I know they will be favorites for years to come! You just made me realize I should look into that for my kids! Such good quality and I’ve been wearing that pullover nonstop! Thanks girlie! Merry almost Christmas!! That lace embroidered dress with the silver on it has stunning on you! Thank you Lori, I loved that one! The black lace dress with the plunging neck line what would you recommend to wear under for a bra or support? I bought the dress and love it but need to wear something for support but with the shear back I am lost as to what to wear with it. Thank you! I will give the plunging backless bra a try and probably get the other one too for other dresses I have not been able to wear! Thanks so much! Happy Holidays! Good!! I hope it works out! Have a great time at the party! What’s the white nail polish color you are wearing? 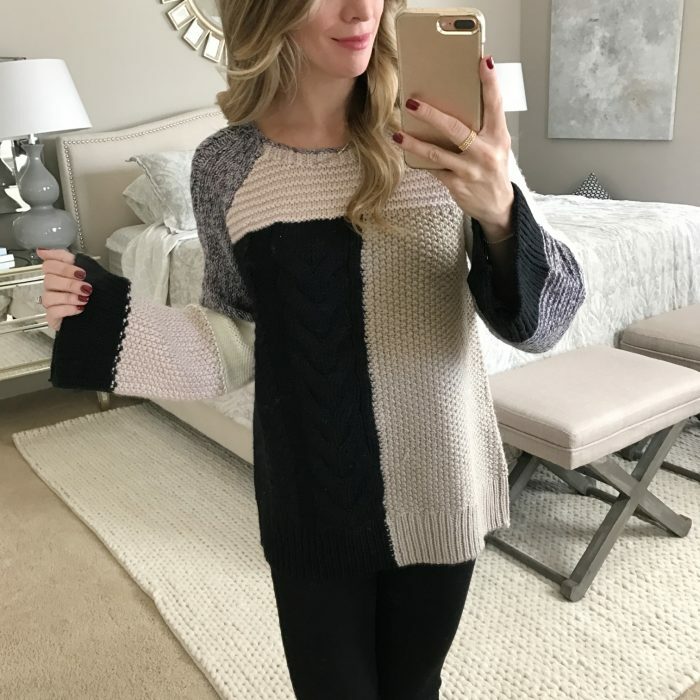 Love it as a winter neutral!